Yup, that is a BIG train!! 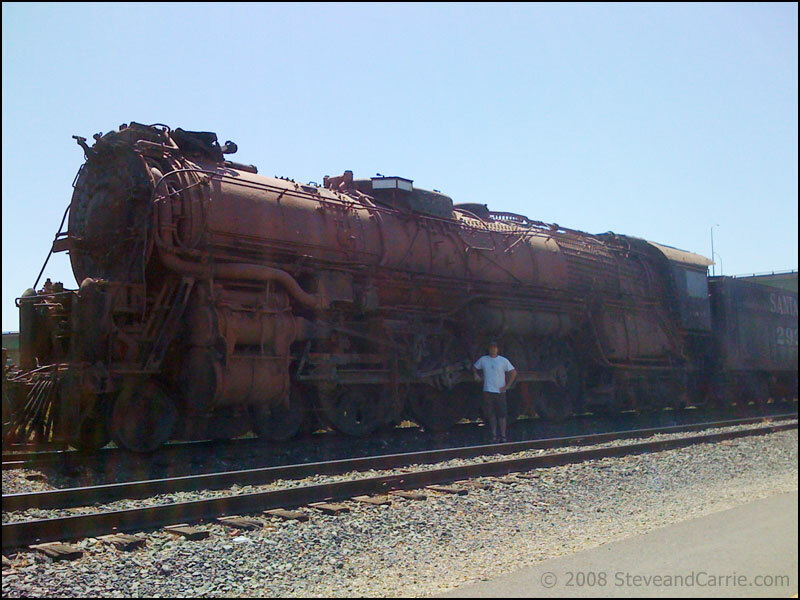 We went for a bike ride today and came across this gigantic train... I had to get a picture, look how small I am next to this classic! We hosted Jim and David's wedding and it was amazing. The setting worked out perfectly and the events was a success! We decided it best to hire this one out, and from the amount of work they have done in the first half day, I am happy we did. We have spent the past weekend at Stillwater cove. Perfect weather, great hiking and play time with the boys. We have spent the past week moving 2 yards of top soil and 3 yards of cedar mulch... and boy are we sore! We finally finished the side yard and it looks GREAT! We are planning a big overhaul in the back yard so I started to move sprinklers and make mounds to plant in... I will post progress pictures as we move along. 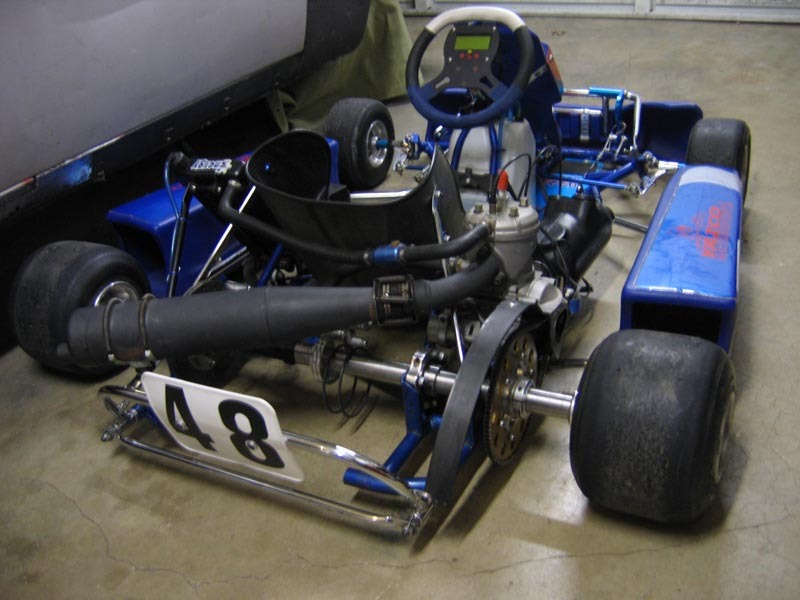 Took the kart out for a practice, was one of only 4 guys there. Did about 40 laps in a couple hours...such fun! We needed to blow off the "stink" and get away for a day. We packed the car and got the dogs in the car and bailed to the coast. Point Reyes coastal beaches are so great and the waves during the day were 15' high! Ah much needed R&R. 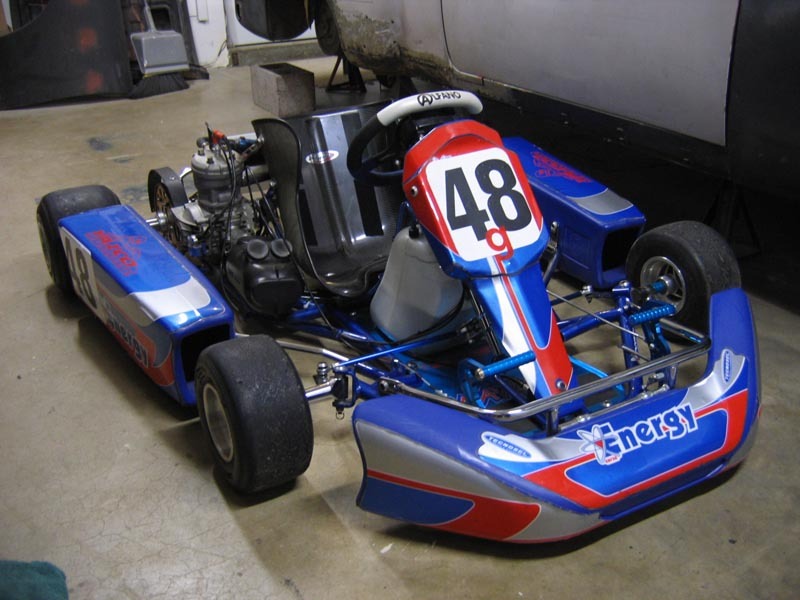 So I have been wanting to get a race kart for a long time now, and after selling the Ducati last year it has been more and more on my mind. So I started looking around and found a beauty, a 125cc Energy TAG Perilla. 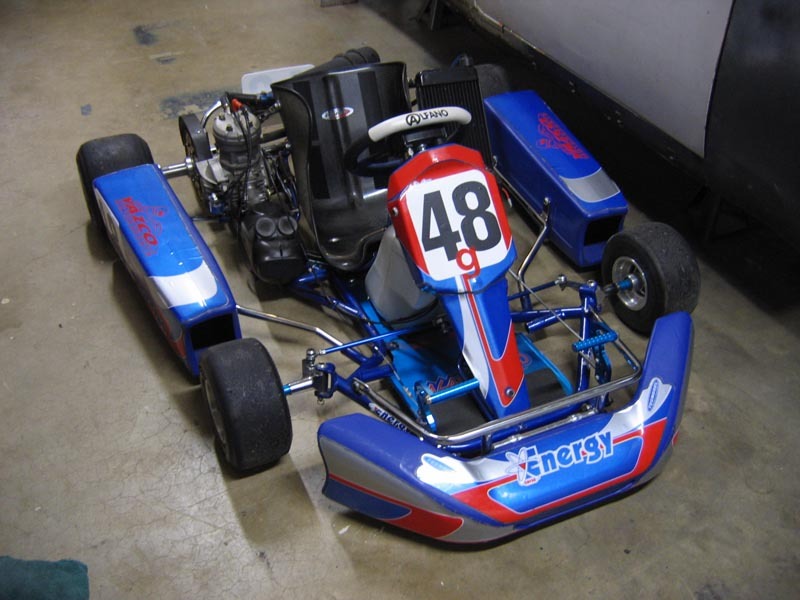 She only has 3 hours of time of the kart and is dang near brand new. Slow I know, but hay I am just one guy and doing all the work myself so gimmie a break. Anyway the 2 door conversion is well underway and the passenger side is almost done. 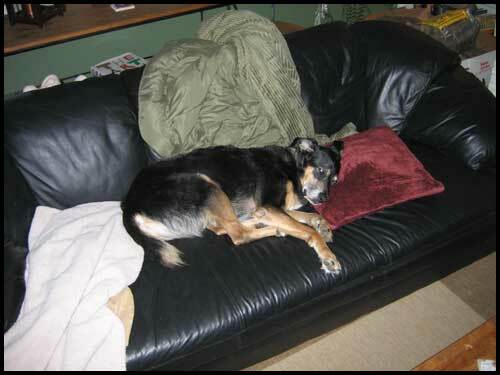 Tonka has taken to the leather couch and often does not even get up to go to bed. He is just so damn cute. Click his picture to see large version. A major storm slammed into California this past week. We had recorded winds at 69 MPH and we lost power Friday at 8:00am until today at 1:00pm. We spent a lot of time with family and friends trying to stay warm. Was a long three and half days! Well it is December 25 and we had the Family over for fun, food and gifts. It was a great Christmas! Well it is December first and that means I can offically hang the Holiday Lights. So I did. Cold weather and holiday lights, dang it must be close to Christmas! We are on our way to being slim, trim and lean mean flex'n machines... we bought a used BowFlex Xtreme 2 off Craigslist and will soon be rockin the home gym! Camping - we went camping yet again! This time no reservations and over to our favorite place, Stillwater Cove! We found a spot and had the BEST weather - 70-75 outside and no wind, perfect. See pictures and movies here. New windows installed in the house! WE ARE CERTIFIED SCUBA DIVERS!!! Carrie and I started our SCUBA training this past week. One night of class, two days of in pool training (full gear) and two days in the ocean (Monterey CA) It was amazing the feeling of BREATHING underwater! what an odd sensation! Camping - we went camping yet again! This time no reservations and packed for the CA coast! We found a spot at Woodside State Park just north of Stillwater. See pictures and read more here. Today is Carrie's Birthday. We went and kayaked at Wright's Lake in Meyers CA. Was so nice. Great weather and a wonderful paddle. There is a great area of marsh just wide enough for kayaks and we spent a few hours discovering the beauty that was around. The drive back was great too - we took a back road that provided some of the best views of the valley we have ever seen...! Finished the day w/ dinner at The Waterboy, a wonderful meal and good wine all in all the day was much fun and we did not want it to end. We went to Foresthill to play with the dogs. The day was a lot warmer then we thought it would be and the lake was packed - temps hovered around 100-102! Dogs sure enjoyed the dip in the cool water as did we! Then we hikes up to the base of the bridge - back to the car and air conditioning! Oh yeah, we stopped and looked at a 6 acre parcel with a nice home in the town of Cool, CA. Someday - oh someday. We went to Yosemite to hike Half Dome on June 22-24. Was warmer then we had thought it would be (90-95). The hike was amazing and tough. We covered 20 miles and went from 4,000 ft to just shy of 8,000 ft in one day! We plan to go back next year and do this again. The Yosemite Valley is just breath taking! Everywhere you look is just ah inspiring. I got the bug bad. 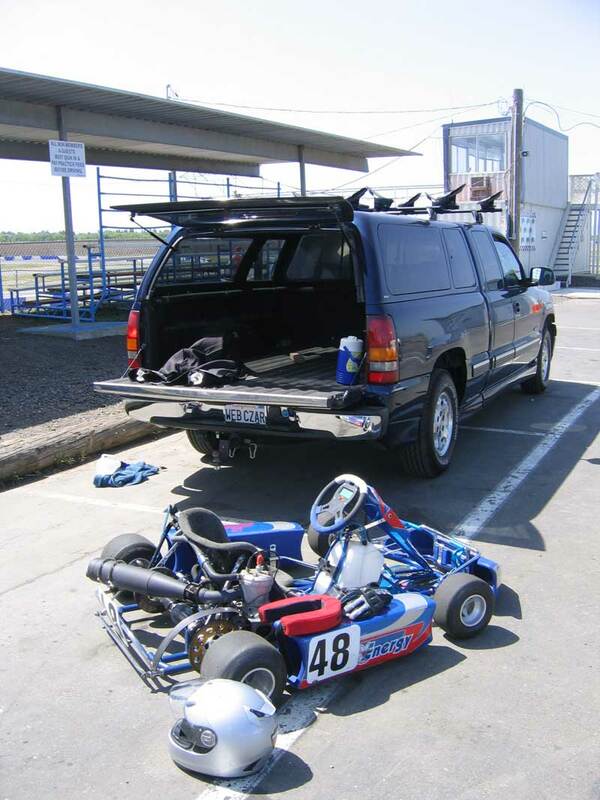 I want to go drag racing again. It has been too long. 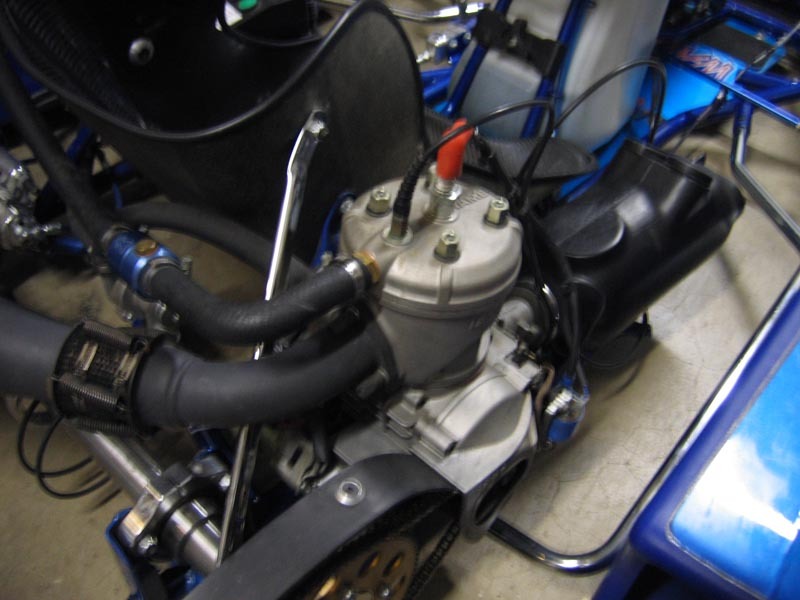 I was searching the local listing on Craigslist and found this wonderful front engine dragster listed. An original Jim Davis built FED!!! I went and look at it and really wanted it to work out! Yet I turned out to be too big to even fit in the cage! Oh well... I keep searching! 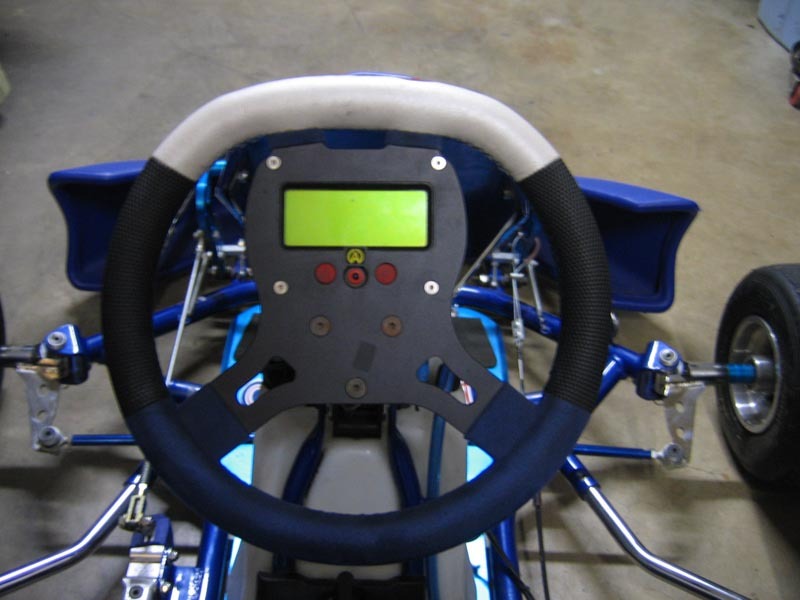 If you have a lead on a dragster - email please! After the car wreck we talked about the Ducati and its future in our family. Well after too many other fellow riders past away on the roads within weeks we made a choice to sell her. I placed an ad on Craigslist and it sold within the first week! I am sad, yes, but alive! Toyota Prius Hybrid is new to our life. As some of you may know the MINI Cooper S was taken from us in an accident on 4-17-07. After the insurance settled out for the MINI we went and picked up the new Hybrid. See pictures of the day we bought the Prius. Images of the damaged MINI Cooper S (Broken Smallzilla). On Tuesday April 14, 2007 at 12:50 pm on Howe Ave (in Sacramento, CA) I was driving my MINI Cooper S north just before University Ave. A car coming south (toward Hy 50) lost control at a high rate of speed and crossed the center median (grassy small hill) and impacted my MINI head on at the driver's front. I was not knocked out and recall everything (good or bad). I was extracted form the car with a possible broken left clavicle, left elbow and internal injures. I was strapped down with back and neck braces and transported to UCD Trauma center and under went many hours of x-rays/ CAT scans and blood work. I am lucky to say that after being on Trauma watch for 24 hours and many doctors later I am past the serious stage and appear to not have any major internal damage. My left clavicle is amazingly not broken yet severely bruised. I have some busted ribs and I am sore everywhere! I am very lucky to be alive, and as the paramedics said they where shocked to see a 6' 4" guy come out of a MINI in such good shape! BMW makes on hell of car I have to say!